The word “Alzheimer’s” sends shivers up the spine when we hear it in relationship to our own loved ones. This very common form of dementia attacks the brain and causes the decline of cognitive functions – thinking, memory, judgment. Each person reacts differently to the disease but what is certain is that it will progress and it progresses faster in some than others. There is good news on the horizon. Pharmaceutical companies are spending billions for research and development for new drugs that “might” slow or stop the progression of the disease. Two such drugs are already on the market. As with all diseases, the sooner you know you have it, the sooner you can begin to plan for it. Do you know these basic signs of Alzheimer’s? Forgetting the work tasks, colleagues’ names or telephone numbers in the moment normal. 90% of the time, you remember them later. People with Alzheimer’s often forget these tasks, names and numbers forever. Leaving carrots on the stove too long is the sign of a busy person. Leaving carrots on the stove perfectly steamed but forgetting to eat them can be a sign of Alzheimer’s. We all can have issues remembering or finding the correct word for a situation but Alzheimer’s will take the simplest nouns and verbs out of the vocabulary. As the disease progresses, descriptions of basic colors such as black dog, white wall and green grass are lost. Forgetting what day it is or which street you’re on from time to time is normal. Getting lost going home from the grocery store that you visit every week can be a sign of Alzheimer’s. Everyone has irrational moments but an Alzheimer’s sufferer has almost no judgement or filter. The daily tasks they used to do no longer exist in their mind and daily functions like dressing and bathing can be forgotten. Everyone can misplace their wallet, glasses or keys. A person with Alzheimer’s disease will place items in completely absurd places: iron in a refrigerator or a watch in a dishwasher. Everyone has mood changes which is often a reaction to your environment. A person with Alzheimer’s is subject to sudden and unexpected severe mood swings with no environmental change. It’s normal for a personality to change with environment and age. 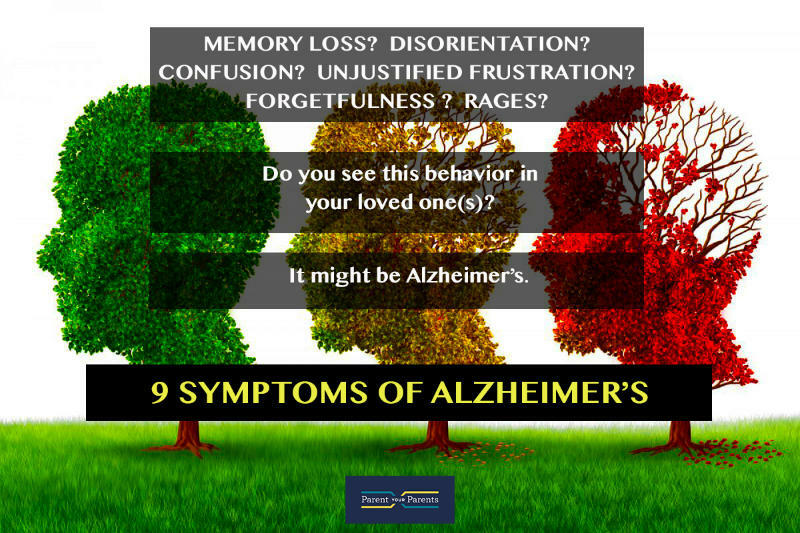 Alzheimer’s can cause fundamental personality changes such as paranoia, fear and inappropriate behavior. From time to time we all become a little bored with our jobs and/or life. The normal response is to ‘move forward’ – do something new or different. With Alzheimer’s even the desire to eat, walk, talk becomes too much. It’s replaced with sitting in a chair, usually watching TV. Do any of the above-mentioned signs sound familiar? If the answer is yes, it’s time to have your loved one evaluated. An Alzheimer’s diagnosis is upsetting but there are positive steps everyone can take to make this as easy as possible for those affected. Give us a call or use our contact form for a FREE consultation.